Art Museum of the Americas’ current exhibit The Ripple Effect: Currents of Socially Engaged Art is, at one level, eclectic. There are videos and computer projections, sculptures and photography, textiles and terrariums. The works of art also address a variety of social issues: economic struggles, immigration issues, pollution, gun violence. There are, additionally, spaces in which artists ask people to fill in the blanks, to express whatever they are contending with. Something Out of Nothing by Olivier Giron and Palas por Pistolas by Pedro Reyes both reinvent objects and address environmental issues. Giron spent time at an illegal dumping site, turning abandoned car parts into planters. 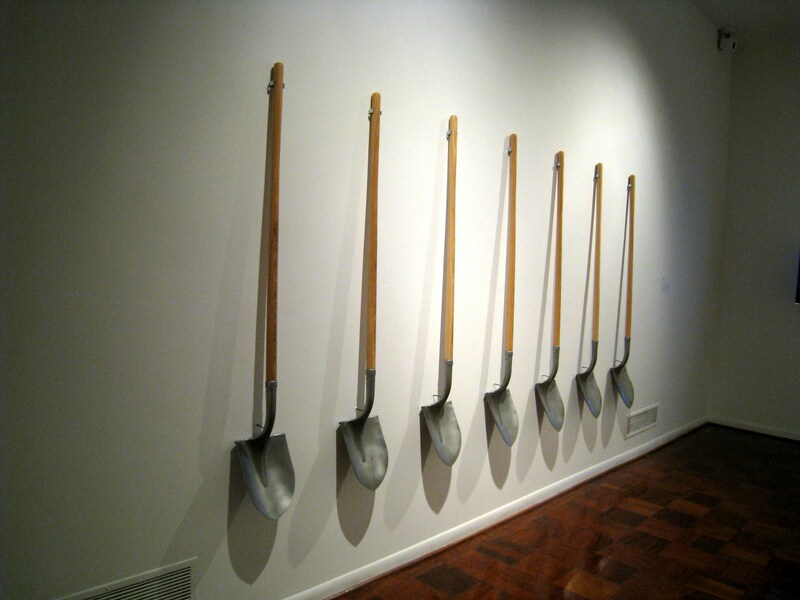 The poignant Palas por Pistolas comes from a project in which people turned in their weapons (in exchange for coupons to save money on electronics), and the weapons were recast into shovels. With these shovels, one tree was planted in honor of each gun collected. Museum visitors participate in making the art in both This is My Love Letter to You, Washington, DC (by Anne Albagli and Vadim Ogietvetsky) and Write Home Soon (by Mark Strandquist). In the former, visitors can type what they love about DC onto a device; these love letters are projected onto the wall. Write Home Soon consists of postcards with pictures and messages about home and loss. Visitors are invited to touch the postcards and to add their own (blank postcards are provided). The installation, similar to PostSecret, grew out of Occupy Wall Street. Today, there are some sad postcards on the wall about the sudden loss of a young pet and sexual abuse by a family member, among other topics. Floating Lab Collective’s Modular Engagement Transporter (M.E.T. ): Mapping Why and Lina Vargas de la Hoz’s Umbrella_Relocation both involve objects in public spaces that can be activated so as to turn them into small tents, providing shelter. Mapping Why contains another component: the artists traveled to numerous parts of DC and asked people to ask a question beginning with “Why?” Many questions asked why jobs are hard to find or why gas and food are so expensive. Some asked existential inquiries. A few people had trouble thinking of a question on the spot. November’s blog theme is Museums Versus the Problems of the World. This entry was posted in Museum Visits (Other) and tagged Art Museum of the Americas, DC, museum. Bookmark the permalink.